Scholarships presented to qualified, needy students. Eligible students from throughout Illinois may make application through the Grand Lodge Office in Lincoln. Read about the history of the Scholarship Committee. See Scholarship Committee to get new Scholarship application. Thirty-five States and five Canadian Provinces have contracts with the Odd Fellow and Rebekah Visual Research Foundation for local eye problems, Illinois is one of those states that is a proud and active participant. The Grand Lodge of Illinois along with lodges statewide support and actively participate in the D.A.R.E. Program. Lodges work on an individual basis with local D.A.R.E. Officers by supplying D.A.R.E. shirts, pencils and rulers to graduates of the program. The members of the Independent Order of Oddfellows are proud to particpate in this worthy community project. Please contact the Grand Secretaries office via the Contact Us section of this website for more information on how you may participate. Built in 1898, Odd Fellow – Rebekah Home‘s original building was part of a private community consisting of a farm, housing for staff, and “The Old Folks Home.” The old 3-story building was torn down and replaced in 1976 with our current single-story building. The Alzheimer’s unit was added in 1996. Our facility is owned by the Odd Fellows Organization and the Rebekah Assembly of Illinois and is operated by Heritage Enterprises. You are welcome to the Fellowship Center, where you’re offered apartment living built just for low-income seniors and the disabled. 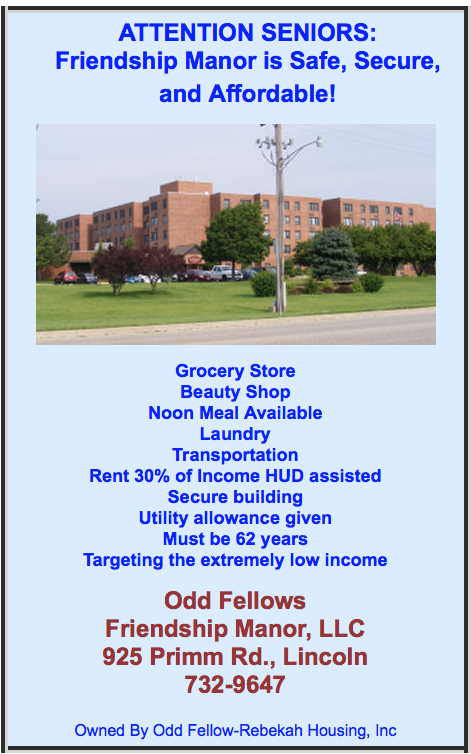 Our facility is located in Mattoon, Illinois next to the Odd-Fellow Rebekah Nursing Home. You can be assured you are choosing the best senior living facility in the area, as we’ve been in business since 1982. We’re celebrating our 32nd year in business. Stop in and you’ll appreciate the modern and secure building that houses 122 clean, one-bedroom apartments. Everything you could need is right here on campus! Learn more about the amenities offered. Join one of the nicest senior living facilities in the area! Stop by anytime for a complimentary tour and see for yourself. Heritage Apartments in Buffalo, Williamsville, and Illiopolis of Illinois is the sister facility to the Fellowship Center in Mattoon. Friendship Manor is located on the property of the former Odd Fellow’s Children’s Home. Choose our residential facility where you’ll be welcomed with comfortable apartments, plenty of amenities, and friendly neighbors all for a price within your budget. You’ll feel at home with comfortable living space, neutral decor and ample storage. You’ll have it all here! Chapel, grocery, and beauty salon among other amenities with rural views! Income limitations are mandated by H.U.D. Rent is 30% of your adjusted gross income! Get an affordable and comfortable apartment.